When you think of wedding reception flowers, you probably immediately think of centerpieces. And yes, centerpieces are a big part of the floral decor for your reception, but don’t stop there. Create a welcoming and personalized entryway for your guests by placing flowers at the venue’s entrance. Feeling creative? Display the arrangements using vessels inspired by the location, such as wine barrels for a vineyard, or wheelbarrows for a barn or farm. Are there steps or a porch leading into the reception space? Dress those up with flowers, too! 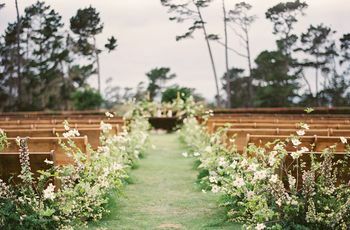 If your reception is taking place under a tent, pair fresh blooms with a welcome sign to create a “main entrance.” This will stand out even more if the tent is open on all sides. Remember that the entryway is where you and your brand new spouse will be announced as a married couple for the first time, so make it special! As soon as your guests walk into the reception space, they’ll probably look for a welcome table so they can sign the guestbook and drop off any cards or gifts (if they brought them). Turn the table into a focal piece by dressing it up with fresh floral arrangements. Make it dramatic with tall, oversized arrangements, or keep things simple with an array of flowers displayed in small bud vases. Your centerpieces will play a large role in shaping the style and ambience of your wedding reception flowers. Tall, lavish centerpieces are great for creating drama and adding instant character to a space, especially one with very high ceilings. Some of our favorite flowers for these types of arrangements include roses, hydrangeas, orchids, and greenery, such as amaranthus or eucalyptus leaves. If you’re going to for a more relaxed look, opt for smaller centerpieces that sit lower on the tables to make the space feel more intimate and cozy. For smaller arrangements, choose statement blooms that can stand out on their own, such as cafe au lait dahlias, sunflowers, spider mums, or even succulents. You can even repurpose your bridesmaids’ bouquets by using them as centerpieces or displaying them in a row of vases as a statement piece. Some couples also choose to mix and match centerpieces, with taller arrangements on some tables and shorter arrangements on the others. Chat with your wedding florist to get their professional input about what types of centerpieces would work best for your venue, style and season. You should also think about the types of centerpiece vessels that you want the flowers to be displayed in—a polished silver vase evokes a different feel compared to a glass jar or a terra cotta pot. Your florist should be able to recommend (and most likely provide) the perfect vessels based on your flower choices. Greenery is not only budget-friendly, but it’s also super versatile—and quite stylish. Until recently, greenery was mainly a “filler flower” that was only for adding the final touch to bouquets, corsages and boutonnieres. 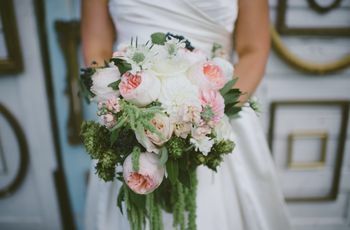 Now, couples and wedding florists are getting creative and using greenery on its own, from decorating the backs of chairs to creating garlands that are draped across door frames. Two of the most popular types of greenery include seeded eucalyptus and silver dollar eucalyptus, which both have a beautiful silvery-green color. If you like herbal fragrances, try using bay leaves or olive leaves. Traditionally, the runner is a long strip of fabric, lace or burlap that is draped across the center of the table from end to end. This is usually paired with a standard centerpiece, but if you’re open to other options, we love the idea of creating a table runner from fresh flowers and greenery instead of fabric. Let this stand alone as your centerpiece on each table, or for added oomph, pair the floral runner with a taller arrangement. This type of runner looks especially beautiful on long banquet tables. It’s also a quick way to make the head or sweetheart table stand out from the rest of your tables. Some couples opt to dine at a sweetheart table (a table for the newlyweds only) rather than with family or at the head table with the wedding party. If you are having a sweetheart table, think about the type of centerpiece you want to use. Do you want it to look exactly like the rest of your reception centerpieces, or do you want your florist to design something that stands out? Try to avoid using a tall centerpiece so you don’t block your view of the reception space. Instead, we love the look of a floral runner draped across the front of the table—beautiful but still practical! 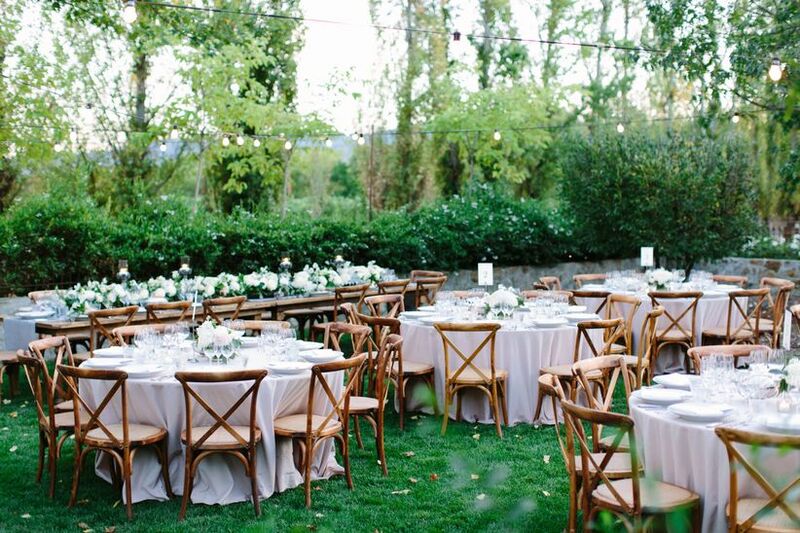 Another way to incorporate fresh flowers at your wedding is by using them to decorate the backs of chairs. 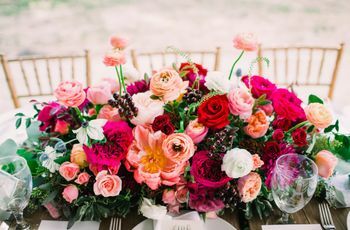 This is typically reserved for the seats of the newlyweds and/or the wedding party, since the cost of decorating every guest’s chair with fresh flowers would add up pretty quickly. It’s a special way to mark where the most important people are seated at the reception. If you want to personalize the look even more, pair the flowers with fabric sashes or hanging signs. Looking for instant wow factor? Decorate your reception space with flowers that hang from the ceiling. We’ve started seeing beautiful suspended arrangements at more and more weddings, and we can’t get enough of them. They bring a sense of romance and elegance to a space and are perfect for taking a tent or banquet room to the next level. 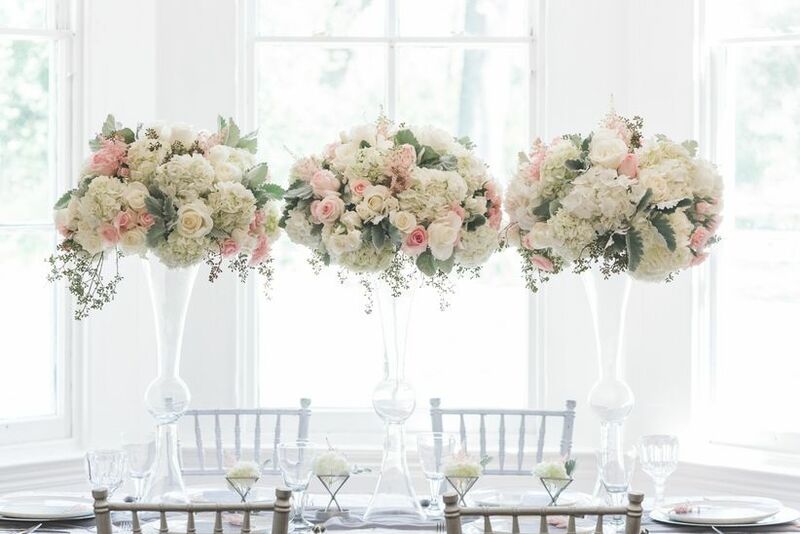 One of our favorite styles is the floral chandelier, which usually features a multi-tier shape (hence the name), but we have also seen arrangements that repurpose unexpected pieces, such as a suspended ladder wrapped in vines or clusters of hanging glass orbs that are filled with single blossoms. The best part about hanging arrangements is that they work for a variety of styles depending on how they’re created. Roses and strands of crystals create a glamorous effect, while pairing greenery with ribbons evokes a relaxed, boho-chic vibe. While your wedding cake is bound to look amazing on its own, you can dress it up even more by using fresh flowers. Share a sketch of the cake design with your florist ahead of time so he or she can plan to bring the necessary flowers on your wedding day. The flowers should tie in to whatever types are being used in your bouquet(s) or centerpieces. A single peony or garden rose looks pretty placed on each tier of the cake, but you can also ask your florist to create a floral topper or show-stopping arrangement that cascades down the side. If you’re having a dessert table or candy buffet, you’ll also want to consider having a few floral arrangements made for that as well. 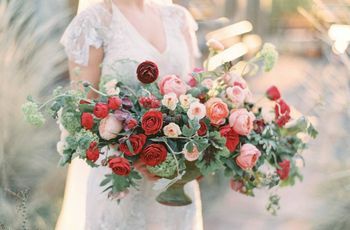 The bouquet toss is a no doubt a crowd favorite, but if the thought of throwing your beautiful wedding bouquet in the air makes you feel a little sad, ask your florist to make a second bouquet specifically for the toss. 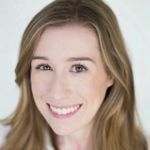 The upside of having a tossing bouquet is that it can be made smaller (and therefore less expensive), and you get to hold onto your real bouquet for a little bit longer. Win-win!